The illegal drug problem has been a serious one in the Philippines for ages and the intensified war on drugs commenced as President Rodrigo Duterte shows determination to end this, waging all out war on drug-related criminals and that includes drug lords, drug pushers and runners. Unfortunately, most media people locally and abroad branded drug related-killings as "EJK" or extra judicial killings. From day one of the intensified operations of the PNP headed by General Bato dela Rosa, the death toll of the so-called EJK increases but the recent killings involved youth and minors that according to their parents and relatives are innocent and do not deserve to die in such way. Just a few days ago, the killing involved OFW children who are allegedly drug runners and users. President Duterte is known to have a hearth with compassion to this sector. the very reason why he hate drugs is that it ruins the lives of the youth and he is determined to crush the drug problem for the Filipino youth to enjoy a safe and drug-free Philippines. But what is happening now? It appears that the youth he is trying to protect against this menace has become the "victims". 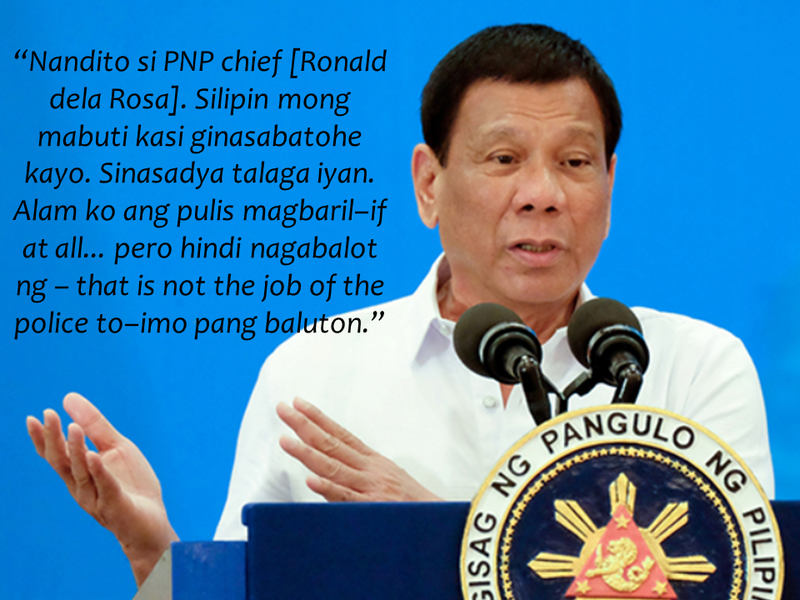 With the recent casualties , whom are sons of OFWs, President Duterte said that the war on drugs is being sabotaged by people who are not happy with his crusade. He stressed that killing and wrapping people [with masking tape] was never a doing of police authorities. If the people who are not happy with the ongoing war on drugs are really doing this as a sabotage, the sad truth is that they are hurting our so called modern day heroes. While their remittances keep our economy from sinking, their family, the reason why they do such sacrifices, are being targeted by criminal entities. What would the Duterte government do to protect them? 25% of OFW sons and daughters are hooked on drugs? During a press conference in Malacañang on March, President Duterte mentioned a yet to be confirmed data that a quarter of OFW dependents are hooked into drugs. Is it the wages of working abroad for the sake of our children's future? An OFW advocate expressed her views about children of OFWs being casualties of drugs. Its either they become addicted to the evil substance or they become victims of the drug addicts. "There are more than 2,000 filipinos overseas detained in various jails on drug charges. Duty-bound, Our Department of Foreign Affairs exerts efforts, allocates government funds, invokes due process in defending them. Are they treated better abroad than in our own country? " 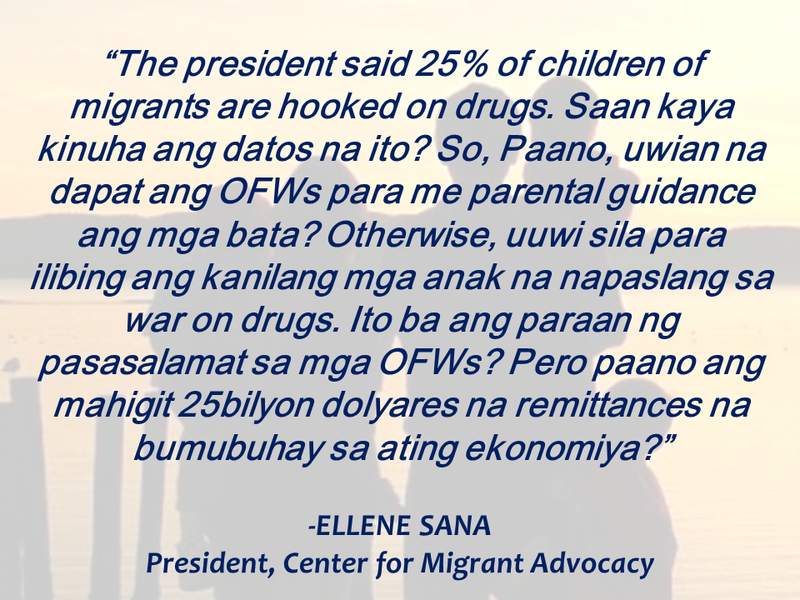 Center for Migrant Advocacy President Ellene Sana said. What shall OFWs do? Do they really need to go home to provide guidance to their children or otherwise they will come home to bury the remains of their beloved kids? President Duterte has a vision for our children to have a better and peaceful community which will not be possible with illegal drugs around. The people involved in the drug trade in the country are surely not happy about it. The best way to help is to guide our children and be vigilant. We all deserve better and we can do it if everyone will start doing our part.